Using quantitative spectral-domain (SD) data from optical coherence tomography (OCT) to train a sophisticated algorithm, a Duke ophthalmologist and researcher is leading a project to create a cost-efficient system that can quantify glaucomatous structural damage on fundus photographs. 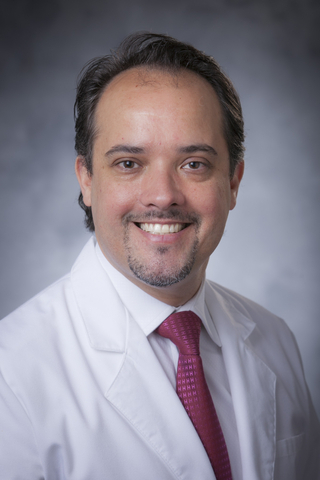 Felipe A. Medeiros, MD, PhD, director of clinical research for the Duke Ophthalmology Division, is working with a team of researchers using deep learning (DL) to develop an objective interpretation of photographic images that can accurately replicate precise OCT measures. Lead author of the study published in December in the Journal of the American Academy of Ophthalmology, Medeiros says the greatest challenge was integrating the DL processes with comprehensive data sets to teach the algorithm to interpret fundus images. Photographs are much cheaper to obtain and can be made widely available, he adds. The downside of photographs has been the need for subjective interpretation by trained experts or glaucoma specialists. “Ophthalmologists frequently under- or over-estimate the amount of glaucoma damage when looking at fundus photographs,” Medeiros says. “This tendency has greatly limited the use of this method for screening and diagnosis. But the newly developed AI algorithm allows objective quantification of glaucoma damage on fundus photos without the need for subjective grading." To train the algorithms, the team used more than 32,000 pairs of optic disc photographs and SD OCT retinal nerve fiber layer scans from 2,312 eyes and 1,198 participants. The data set was collected from the Duke Glaucoma Repository, a database within the Vision, Imaging and Performance (VIP) Laboratory of the Duke Eye Center. Ophthalmologists frequently under- or over-estimate the amount of glaucoma damage when looking at fundus photographs. This tendency has greatly limited the use of this method for screening and diagnosis. But the newly developed AI algorithm allows objective quantification of glaucoma damage on fundus photos without the need for subjective grading. The AI algorithms can interpret photographs and determine whether nerve damage exists and, if so, quantify the amount of damage. The assessment is accomplished by having a camera record a picture of the optic nerve and then using a computer powered by the DL algorithm to provide the interpretation. “We tested how the algorithm performed on an independent set of eyes and found an excellent correlation between the predictions given by the DL algorithm and the actual measurements obtained by OCT,” Medeiros says. The system offers several advantages over OCT. As a less costly, portable technology, the algorithm-based scanning process could potentially be used for glaucoma screening in underserved areas. Because glaucoma is generally asymptomatic until late stages, many patients do not know they have the disease. Screening efforts are essential to prevent irreversible vision loss. “But it has been very difficult to come up with an effective screening tool for glaucoma,” he says. “I believe that an objective photo-based system has the potential to be such desired tool.” The system could also be deployed in primary clinics for opportunistic screening.